The property overall is in need of a refresh. I found the low lighting in the hallways to be strange. We had parking lot view but can see the marina from the balcony. It was a small street but very noisy. Good sliding glass doors make the rooms not as noisy when closed though. We couldn’t relax by the pool because of construction noise at the Ilikai next door, very loud when sitting at the shallow pool. The shower water pressure was great. Shampoo etc were also great. The cafe menu was limited so we didn’t eat at the Grove. At night there was a bar with live music opening up behind a rotating bookcase called the Study, we went there for a bit. Overall we paid for the rooms then 30 extra per day per room for amenities but couldn’t really enjoy any of that. We constantly had to Uber to places like Ala Moana mall or down toward the Sheraton area to get food so it was a bit difficult for us. The little tide pool area was ok but there was a strong smell to it and hotel staff told us not to bathe there due to it being dirty so we had to walk down to Waikiki beach to swim. Overall it was a cute boutique hotel but for the price we would rather be at a different location. Loved the aesthetic of the Hotel - the gym was clean and nice. Food was great, ambiance was great. I arrived and it took me a while to find the property as I was driving to the hotel. It was hard to find at first, but I found it. The staff was nice, but I didn't like having to talk to the concierge about offering a "discount" if we wanted to attend a "vacation meeting" in the morning. Other than that, it was a nice stay at the hotel. I don't have any other complaints. Nice hotel, 20 minutes from airport. Small, fast and easy check in. 5 minute walk to the beach. Hotel has pool/beach towels that are light, good size. Always cold water is available by the pool towel stand, along with sunscreen. Housekeeping is great. Rooms are nice, clean with all amenities. Bottled water in the room. Grove restaurant is yummy, good service but watch out for those birds. More younger crowd feel, a bar , nightclub which is complementary for guests. All the staff were really nice, always felt welcomed. Hotel is in great area, only 7 minutes away from Waikiki. And a 6 minutes walk to Alamoana shopping center. It was a nice hotel filled with young people and friendly staff. My only wish was that the hotel was on the beach rather than walking 10-15 mins to get to the beach. Please avoid staying at this hotel during weekend. There is a nightclub in the building, but the noise level is terrible. Worst ever. I stayed on 4th floor, but from 10PM till 3AM you literally feel bass sound and even teembling! Entire room and even my bed(!) vibrated. I complained about it three times, but no apology. They say that there is an explanation about the noise level in their website but I couldn’t find any information. I tried to make a last complaint while I was checking out but a receptionist just said “Do you want to talk to our manager?” without any apology. Yeah, it’s a “boutique” hotel and the place is supposed to be chic and cool, but if you hear DJing sound and feel the bass on your bed at 2:30AM that is seriously wrong. Period. clean room, nice room. parking is a bit pricey. front desk employees not as informative. Great location! Big room with modern design and great amenities. Very friendly staff. Nice facility with very bright, clean and inviting room. However the lobby could use some work and updating but not terrible. The hotel itself is quite lovely. Wasn’t too keen on the night club entrance being beside the main entrance. Felt like I was in Vegas. Just wasn’t my thing. The rooms are very basic but clean. The partial ocean view was nice with the marina across the street. The staff were very kind and helpful. And the shortbread cookies with the turn down service were a nice treat. I also liked that the hotel was off the busy part of Waikiki. It was a nice break. And there’s an ABC store across the street open till midnight. Hotel was amazing. So many options for entertainment. Loved the pool and food. Will plan on staying there again. Nice hotel, staff very friendly, hotel room clean. We held an event in the ballrooms and everything went very smooth. The service was impeccable. Domonique was amazing and Yuki tended bar for us. She did an amazing job as well! All staff put us first. The onlything I would change the pool to an adult pool and no kids and also, put microwaves in rooms. The Modern Honolulu by Diamond Resorts places you in Waikiki, within a leisurely stroll of popular sights such as Hawaii Convention Center and Ala Moana Center. This 353-room, 4.5-star hotel welcomes business and leisure travelers with 2 outdoor pools, a full-service spa, and a restaurant. Enjoy a bite to eat at Passageways, the hotel's onsite restaurant. Order from 24-hour room service to satisfy your hunger without leaving your room. For your convenience, a cooked-to-order breakfast is served for a fee each morning from 7 AM to 10 AM. A 46-inch LCD TV comes with cable channels, and guests can stay connected with free WiFi and wired Internet. Pillowtop beds sport premium bedding and down comforters, and the bathroom offers a hair dryer and designer toiletries. Other standard amenities include an iPod dock, a coffee maker, and free newspapers. 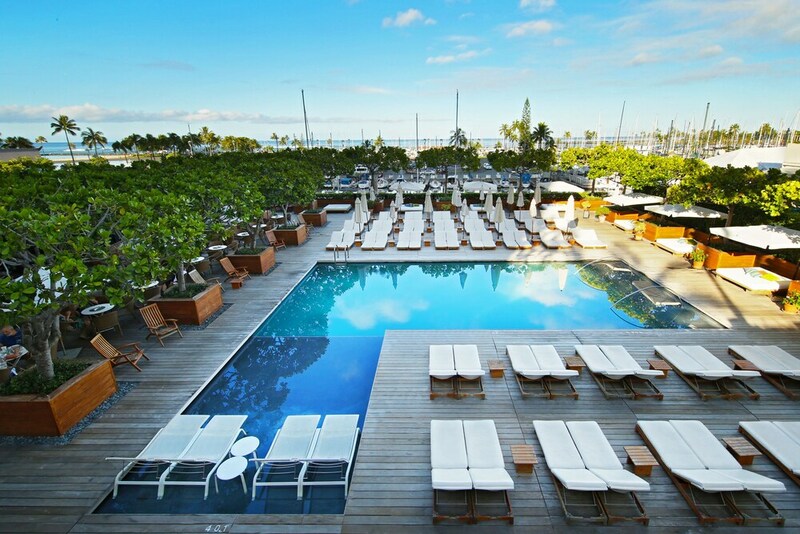 Guests of The Modern Honolulu by Diamond Resorts have access to a full-service spa, 2 outdoor pools, and a nightclub. Valet parking is available for USD 35 per day. The front desk has multilingual staff on hand 24/7 to help with tours or tickets, securing valuables, and dry cleaning/laundry. Other amenities at this luxury hotel include a fitness center, a rooftop terrace, and free WiFi in public areas. Aloha and thank you for your valuable feedback. We are glad you enjoyed your stay with us and we look forward to welcoming you back in the future! Aloha and thank you for choosing The Modern Honolulu for your recent stay in Waikiki. We hope to welcome you back as a valued guest in the near future. Aloha and thank you for your valuable feedback. We are in the process of re-constructing our hallways and units. We hope to welcome you back in the future to experience our refreshed look. Thank you for the feedback regarding your recent visit to The Modern Honolulu. We will take the criticism seriously as we work to improve our service and amenities. As we embark on our highly anticipated remodel we hope the improvements will better meet your needs. Thank you for the feedback regarding your recent visit to The Modern Honolulu. While we are pleased that you enjoyed your stay in general we are distressed that we were not able to obtain 5 stars from you and hope that you will return soon so that we might provide even better service this time to warrant those 5 stars! Thank you for your valuable feedback! We appreciate your 5 out of 5 review! Look forward to welcoming you back in the future! Thank you for the feedback regarding your recent visit to The Modern Honolulu. While we are pleased that you enjoyed your vacation experience in general we are distressed that we were not able to obtain 5 stars from you and hope that you will return soon so that we might provide even better service next time to warrant those 5 stars! Aloha, Thank you for taking the time to provide honest feedback regarding your recent stay with us. We do take criticism seriously and work hard to improve. Aloha, Thank you for taking the time to provide us with your rating. We would like to hear more about your experience with us. Mahalo and we look forward to hearing from you. Cooked-to-order breakfast is served daily from 7 AM to 10 AM for a fee. Passageways - Pool-view restaurant open for breakfast, lunch, and dinner. Open daily. 2 outdoor swimming pools are on site, and the hotel also has a fitness center. Guests under 18 years old are not allowed in the swimming pool. The front desk is open 24 hours a day, and checking in is easy with express services. Driving? This property offers valet parking (fees apply).